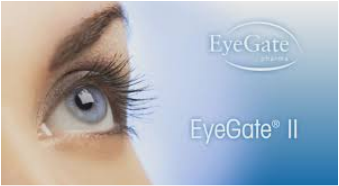 EyeGate Pharma is a private pharmaceutical company specializing in the development and commercialization of treatment for eye disorders. The company uses iontophoresis to administer safe and non-invasive therapeutic agents into the eye to treat serious eye diseases . The company is listed on Nasdaq, since February 2015.